Anne Fadiman, the Francis Writer-in-Residence at Yale University and a member of Harvard’s Board of Overseers, explored the varieties of book lover in “Using Bacon for Bookmarks: How Readers Treat Their Books.” The talk was a fitting installment in the John Harvard Book Celebration, which took place April 1 at Cambridge Public Library. The writer Anne Fadiman made a confession Sunday evening to a roomful of shocked Cambridge Public Library patrons. It was a tale of familial abuse — of the bookshelf, that is. Fadiman, the Francis Writer-in-Residence at Yale University and a member of Harvard’s Board of Overseers, explored the varieties of book lover in “Using Bacon for Bookmarks: How Readers Treat Their Books.” The talk was a fitting installment in the John Harvard Book Celebration, a semester-long series of events at Cambridge and Boston public libraries in honor of Harvard’s 375th anniversary and John Harvard’s original gift of 400 books to the University. “Love of books is like any other kind of love,” Fadiman said. “It takes different forms.” There are “courtly lovers” of books, who treat books as sacred objects, and “carnal lovers” — those who engage with their books as physical objects, and who are more than willing to profane them in all manner of ways. 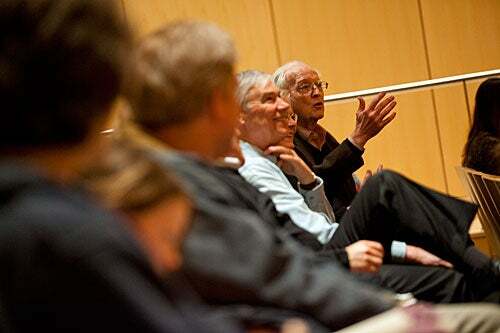 Richard Griffin '51 (right) asks a question of Anne Fadiman following her talk. Examples of the latter camp abound. Wordsworth once cut open the pages of a new book (a necessity due to the bookbinding techniques of his time) with a butter-greased knife, according to Fadiman. William Empson was reprimanded by a librarian for returning a copy of “Dr. Faustus” smeared with jam from his morning toast. A Columbia University librarian reported a returned book with a fried egg in its pages. And as per the tale that provided the lecture’s title, New Yorker legend A.J. Liebling was said to have used a strip of bacon for a bookmark. Harvard librarians, Fadiman reported, have found in the pages of books a sewing needle, feathers, playing cards, yarn, a parking ticket, an arrest warrant, “a piece of fuzzy pink cake that was presumed to be a former Hostess Sno Ball,” and even a used condom. Indeed, annotation is a controversial topic among book lovers. While few readers would cop to scribbling in the margins of a library book, many bibliophiles disagree over whether one should annotate books at all. Paperbacks, hardbacks, first editions, family heirlooms, borrowed copies: Most readers have their own rules for what can be marked up, she said. The president of the Levenger catalogue, a high-end reading and writing instrument retailer, once told Fadiman that to avoid the temptation to scrawl when reading nice books, he held a chopstick in his free hand instead of a pen. Fadiman frowned on the technique. Ultimately, Fadiman professed equal respect for both types of book lovers. Alexander the Great slept with a copy of Homer’s “Iliad” annotated by Aristotle stashed under his pillow. While that courtly attitude toward books seems foreign to many of us now, she said, Alexander’s respect for the printed word is something book lovers of all varieties have in common. What would Fadiman keep under her pillow? An anthology of world poetry that belonged to her father, the critic Clifton Fadiman. Though he made his name writing about Western literature, Fadiman said, her father began to discover the power of other cultures’ works in his 80s. That idea of the scuffed-up, marked-up book as a vehicle for dialogue — especially among different generations — resonated with at least one member of the audience. The next John Harvard Book Celebration event, “From the Hearth to Kindles and Nooks: Fairy Tales in an Age of Electronic Entertainments,” will feature Maria Tatar, John L. Loeb Professor of Germanic Languages and Literatures and of Folklore and Mythology. The lecture will be held April 5 at 6 p.m. in the Boston Public Library, Dudley Branch, 65 Warren St., Roxbury. "Holi is primarily a celebration of the coming of spring and commemorates various aspects of Hindu mythology," said Neil Patel '13, co-president of Dharma. "The festivities usher in spring and the season of love."